BU will play its second outdoor game of the modern era on January 11 as it returns to Fenway Park to take on Maine in “Frozen Fenway 2014.” The game is the nightcap of a Hockey East doubleheader that will see defending conference champ UMass Lowell meet Northeastern in the first game. 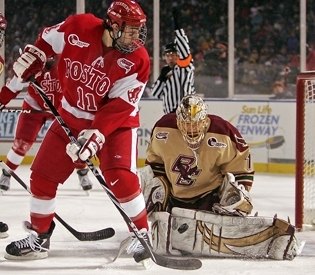 On January 9, 2010 with a light snow falling, the Terriers defeated BC, 3-2 (video), before 38,472 fans at Fenway, the largest crowd to see a college game in the Eastern U.S. and outdrew the NHL’s Winter Classic by 360. Next season’s outdoor meeting with the Black Bears is a conference game, one of 20 Hockey East games for BU in the new conference schedule. With Notre Dame becoming the 11th Hockey East team in 2013-14, each team will play the other ten twice. As a result, out-of-conference schedules will expand from 7 to 14 games. Thus far, the Terriers out-of-conference schedule includes: Cornell (Red Hot Hockey), Michigan, Michigan State, Wisconsin, North Dakota (2), Rensselaer, Holy Cross, Bentley and two Beanpot games. BU’s will begin next season on Friday, October 11 against UMass-Amherst and then take on Holy Cross the next night. In NHL Central Scouting’s final rankings, 2014 recruit goalie Shane Starrett was rated #15 among North American goalies. The 6-4 netminder from Bellingham, Mass, who completed a standout season with the Selects Hockey Academy U18s, had been ranked #35 in the midterm rankings. 2014 recruit Jack Eichel and Team USA take on host team Russia tomorrow in the semifinals of the World U18 Championships in Sochi. Eichel, who is the youngest player on Team USA, has a goal and an assist in five games. Several internet sources have reported that Kimball Union Academy forward Nick Roberto, who recently decommitted from Maine, is being recruited by BU and several other Hockey East school. The Wakefield, Mass., product scored 23 goals and 25 assists in 29 games this past season for the Wildcats, who were captained by 2013 BU recruit Doyle Somerby. Roberto was named USHR’s Prep Forward of the Year. Returning to the ice after six weeks on the injured list, Nick Bonino earned second star honors with a pair of assists in Anaheim’s 3-1 win against Edmonton. Kevin Shattenkirk scored his fifth goal of the season in the Blues’ 5-3 loss to Colorado. Alex Chiasson remained out of the Stars’ lineup tonight with an injured shoulder, but hopes to return for Dallas’ regular-season finale against the Red Wings. Senior Jennelle Kohanchuk, junior Marie-Philip Poulin and three former Terriers, Jenn Wakefield, Catherine Ward and Tara Watchorn, were named to the initial Team Canada roster for the 2014 Olympic Winter games in Sochi, Russia. In 2010, Canada won the Olympic gold medal, defeating Team USA behind a pair of Poulin goals. News update--Friends' Banquet tonight at 6 p.m.